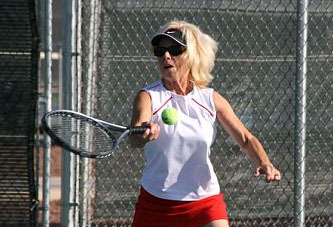 For Sedona's Lynn Sanford, there literally aren't enough hours in the day to squeeze in tennis. And if there was, she'd probably still ask for a couple more. 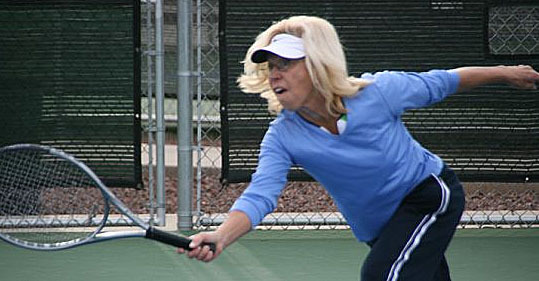 This never-stop-going lady has a crazy love for the sport, so much so that she and her husband recently purchased a patio home in Phoenix, so that she could find a way to get more court time in by adding in Central Arizona leagues on top of her steady play in Northern Arizona leagues. 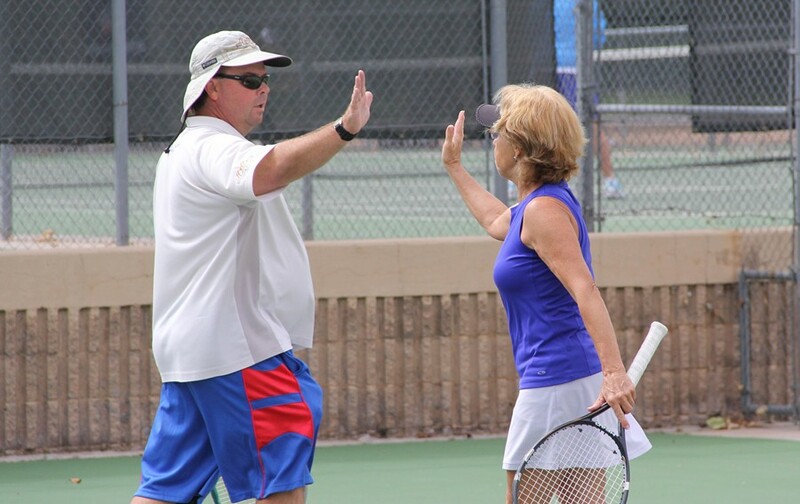 Sanford has been wearing out the pavement between Sedona and Phoenix on an almost-daily basis, shifting gears back and forth the last couple of years to get her fill of league tennis. It didn't take long for them to come to the conclusion that the simplest thing might just be to have a place in both spots. So they purchased a patio home in Phoenix...and now the floodgates really opened up. An already-frequent player before the home purchase, averaging about four league teams per year the last handful, Sanford has upped the amount of USTA league teams she's on this year to seven teams. She just-started on an 2013 early start league team in Central Arizona, so she's already getting a jump on 2013. Sanford has played in virtually every division she's been eligible for the last couple of years and has been a regularly-seen competitor at Section Championship events.In the last couple of years alone, Sanford has been on Tri-Level, Adult, Senior, Senior Mixed, and Super Senior teams. This go-get 'em lady doesn't appear to be stopping anytime soon and is the truest definition of an Active Forever USTA member. We recently caught up with Sanford (in email - since she's hard to pin down) to get her take on her obsessive love affair with tennis. USTASW: How did you get the bug for tennis? What was it that bit you so hard and has made you love it? LS: I started playing competitive tennis in 1995 and have played competitively ever since. It's a sport that makes you try to out think your partner. I take lessons and drill on a regular basis with Claudette Lalilberte - Sedona. I love the challenge of continuously learning and implementing new shots. It's a good physical and mental sport and can be played forever. USTASW: You have a really interesting story that reveals your love/obsession with this sport: You actually have a dual residence in Sedona and Phoenix because you want to play so much. Would you tell us a bit about that and why that is so? LS: My husband and I have a house in Sedona but recently purchased a patio home in Scottsdale. The reason is that we wanted to get out of the cold in the winter, needed a scenery change, and so I can play more tennis on several different leagues, which all start in September. I play on an ATA, Play Tennis and Inter-Club during the week and USTA leagues on the weekend. There are more leagues in The Valley and the weather is perfect to play tennis from Fall to Spring. My husband and I spend the summers in Sedona. USTASW: Is it a lot of driving? Sounds like you're either on the court, or in a car on your way to a match for most of your days! LS: Yes, I play tennis 5+ days a week everywhere in the Valley. I do travel back and forth to Sedona regularly (about 100 miles each way), but I don't mind driving. During my off tennis time, I have a small advertising business that can be operated from anywhere as long as I have my computer. USTASW: Do you ever sometime think that's just crazy or an unhealthy obsession? Or, are you just crazy like a fox? Couldn't you have just built a court at your house? LS: It's too expensive to build a court and not enough space. There are times I think I'm crazy for playing so much tennis but then I'm off for a day and I miss playing. It's a good obsession to have. The challenge of winning and the exercise is good. USTASW: Have you made a lot of good friends through tennis? LS: I've made a ton of friends through playing tennis, so many. It's definitely aided in me having a good healthy social life. USTASW: We see you're on seven USTA League teams (playing just about every possible level that you can) so far this year and you're also on a 2013 early start league that's just started, but from what you've told us that just scratches the surface. Tell us how often (hour-wise) are you on court for tennis in a week in other leagues, for practice and for fun? LS: OMG! I play 5 times a week, drill an hour and sometimes take an hour lesson on top of that. So, how many hours do you think that would be? Does that add up to a ton of hours? Plus, I make sure and stretch before and after every match which adds up to another ½ hour a day. What do you think? Oh, and when I'm not doing the above I'll sometimes hit tennis balls and drill with my husband who is an excellent tennis player. So, I guess you could say I spend a lot of time on the court. Hours? I'm honestly not sure how many. USTASW: What has USTA membership and USTA League tennis and tournaments done for you from a social standpoint and a physical standpoint? LS: Tennis has helped me immensely with my physical conditioning. I feel good and plan on playing tennis as long as I can. I've met so many wonderful people. It has been a great sport in so many ways. It's been such a great impact on my life. USTASW: Do you even have time for other hobbies? If so, what do you do? LS: I also bike ride, go for walks, read books, spend time with my husband and have a small real estate advertising business that I operate when I'm not on the court. USTASW Is my playing style indicative to my personality? LS: Hmm...that's a tough question. Yeah, I guess so, but every day differs on the court as you well know. - Lives in Sedona, Ariz. Active Forever is the official "Medical & Sports Therapy Equipment Provider" and a sponsor of the USTA Southwest Member Profile. The company promotes and supports a healthy lifestyle we want and hope for all of our USTA members. USTA members receive discounts at Active Forever’s store location in Scottsdale and online at www.activeforever.com.